In 2016, Ueda and her team at ITbM, Nagoya University, were able to build a live cell imaging system and use it to discover the asymmetric cell division in Arabidopsis thaliana zygotes (fertilized plant egg cells). They discovered that upon fertilization, the nucleus moves upwards in the zygote, leading to asymmetric cell division. Nagoya, Japan - the team was interested in the dynamics of the vacuole, which is a big water-filled organelle in plant cells, and its effect on asymmetric cell division. Using their powerful live imaging tool, the team discovered that vacuoles shrink drastically upon fertilization, and move down to the bottom of the zygote through so-called tubular strands. Moreover, vacuole dynamics proved to be essential as when working with a mutant where the vacuole shape change was disturbed, the tubular strands did not form, the cell division was not asymmetric anymore, and the plant formation was disrupted. This novel observation left the team astonished and unsure to what was guiding these tubular strands and vacuole movement. They noticed, however, that the tubular strands were quite similar analogically with F-actin, which is a linear polymer microfilament formed along the top-bottom axis of the zygote. With this in hand, the team set out to investigate the power of F-actin in tubular strand formation by blocking F-actin with inhibitors, which lead to non-formation of the tubular strands and a symmetric cell division. This allowed the team to draw the conclusion that F-actin is guiding the tubular strands, allowing vacuole movement and leading to an asymmetric cell division and, thus, a healthy and normal plant shape formation. In the future, the team would like to observe the dynamics and function of the vacuole in other plant species or in the already developed root and leaf using their powerful live imaging system. 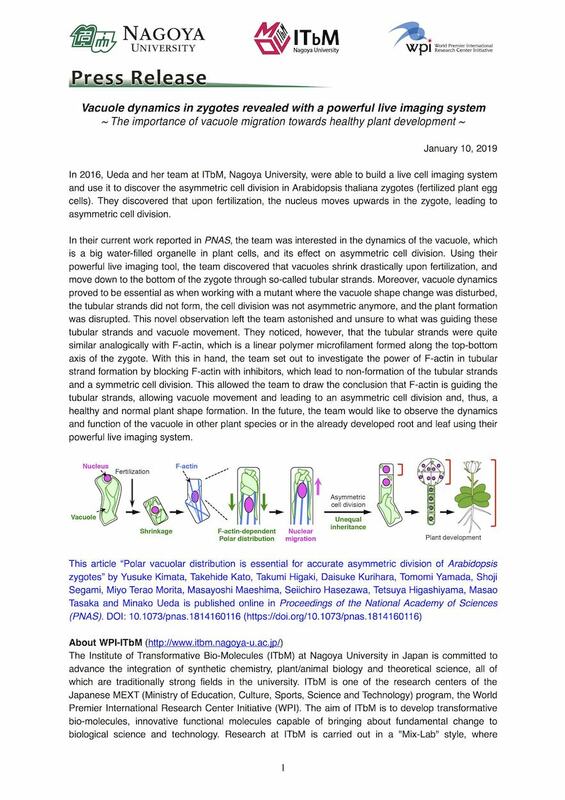 This article "Polar vacuolar distribution is essential for accurate asymmetric division of Arabidopsis zygotes" by Yusuke Kimata, Takehide Kato, Takumi Higaki, Daisuke Kurihara, Tomomi Yamada, Shoji Segami, Miyo Terao Morita, Masayoshi Maeshima, Seiichiro Hasezawa, Tetsuya Higashiyama, Masao Tasaka and Minako Ueda is published online in Proceedings of the National Academy of Sciences (PNAS).